Gustav Roch's parents were Gustav Adolf Roch, a kitchen assistant, and Auguste Caroline Büttner. Gustav attended school in Dresden before moving to a school in Neustadt. At this stage mathematics was not his main interest and his father encouraged him to seek a career in chemistry. With this aim in mind he entered the Polytechnic Institute (Technische Bildungsanstalt) in Dresden taking courses to qualify him in chemistry. A very important influence on Roch was Oscar Schlömilch who taught at the Polytechnic Institute. Schlömilch received his university education at Berlin under Dirichlet and Steiner. He was a fine mathematician who wrote an excellent analysis textbook which helped the development of rigorous analysis in Germany. He quickly saw that Roch's talents lay in mathematics and its applications to physics, rather than in chemistry, and he soon persuaded Roch to seriously consider changing the main topic that he was studying. This was not a simple matter, for Roch did not have a particularly strong background in either mathematics or physics, so in order to prepare himself for advanced study he took courses at a private institute as well as at the Polytechnic Institute. In fact he was soon producing high quality research and, while still at the Polytechnic Institute, he wrote a paper Über eine Umgestaltung der Ampere'schen Formeln Ⓣ on the mathematical theory of the electricity and magnetism. This paper was published in 1859 in Schlömilch's journal Schlömilch's Zeitschrift für Mathematik und Physik. This was a fairly new journal which Schlömilch had founded three years earlier. 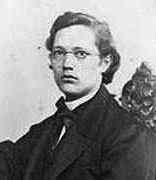 In the spring of 1859, the same year as his first paper was published, Roch entered the University of Leipzig. He studied a wide range of courses there but the most important of his teachers in mathematics were A F Möbius, M W Drobisch and W Scheibner, while he was taught physics by Wilhelm Hankel. However he also took courses on philosophy, botany, philology and history. Roch continued his research on the mathematical theory of electricity and magnetism, publishing four further articles Über magnetische Momente Ⓣ (1859), Über Magnetismus Ⓣ (1859), Bemerkung zur Theorie der electrischen Ströme Ⓣ (1860), and Über Magnetismus Ⓣ (1861), all of which appeared in Schlömilch's Zeitschrift. His outstanding progress as a student at Leipzig led to him being awarded the Kregel-Sternbach scholarship to continue his studies at Göttingen and Berlin. On 13 April 1861 Roch entered the University of Göttingen. He spent three terms there studying under Wilhelm Weber, but also attending lectures by a number of top mathematicians the most important being Riemann. Following his time in Göttingen, Roch went to Berlin where he made contact with L Kronecker, E E Kummer, K Weierstrass and K W Borchardt. Roch was awarded a Master's Degree by the University of Leipzig in 1862 and later that year, on 28 May, he was awarded his doctorate for his thesis Über die Darstellung von Functionen dreier Variablen durch Potentialausdrücke ... Ⓣ His thesis advisors had been Moritz Drobisch and Wilhelm Hankel. After the award of his doctorate, he continued to work at Leipzig during 1863. Roch submitted his habilitation thesis De theoremate quodam circa functiones Abelianas Ⓣ to the University of Halle on 13 October 1863. His habilitation thesis advisor was Eduard Heine. He became a privatdozent at Halle and, in the following year, he submitted his most famous paper Über die Anzahl der willkürlichen Constanten in algebraischen Functionen Ⓣ to Crelle's Journal. It appear in print in the following year and contains the theorem now known as the Riemann-Roch theorem. It was not the first of Roch's papers to appear in Crelle's Journal for he had published Über eine Transformation des Potentials Ⓣ in it in 1864. Several other papers by Roch such as Über Functionen complexer Grössen Ⓣ (1863), Functionen complexer Grössen Ⓣ (1865), and Über die Ausdrücke elliptischer Integrale zweiter und dritter Gattung durch Theta-Functionen Ⓣ (1865) had appeared in Schlömilch's Zeitschrift für Mathematik und Physik. As presented by Roch, the Riemann-Roch theorem related the topological genus of a Riemann surface to purely algebraic properties of the surface. The Riemann-Roch theorem was so named by Max Noether and Alexander von Brill in a paper they jointly wrote 1874 when they refined the information obtained from the theorem. It was extended to algebraic curves in 1929 and then in the 1950s an n-dimensional version, the Hirzebruch-Riemann-Roch theorem, was proved by Hirzebruch and a version for a morphism between two varieties, the Grothendieck-Riemann-Roch theorem, was proved by Grothendieck. Over the three academic years 1863-64, 1864-65 and 1865-66 Roch gave a number of courses at Halle. These included: Differential and Integral Calculus; Analytic Geometry; and Elliptic and Abelian Functions. Up to this time Roch was still a privatdozent at Halle but in the spring of 1866 the University began to take up referees' reports with a view to appointing him as an extraordinary professor. Heine wrote a strong letter of support and Roch was appointed extraordinary professor at the University of Halle-Wittenberg on 21 August. However Roch's health was failing and on 13 October he was granted leave for the winter semester of 1866-67 to allow him to regain his health. Roch went to Venice where he hoped the warmer weather would aid his recovery. Sadly, however, it was not to be and he died of consumption in Venice in November at the age of 26 years. Roch's name will live on through the fundamental Riemann-Roch theorem, but it is a tragedy that the young man with so much mathematical promise died when he had only just commenced his career.